Accommodation is limited on some sections of the walk. Please book early to ensure your place. Beautiful secluded bays such as Lulworth Cove and towering cliffs such as Golden Cap the highest point on England's south coast. "The booklet was a lovely keepsake, with personalised touches. We had a great week with perfect weather for walking. The distances between overnight stops was just right." E. Darby, UK. A range of guest houses, bed and breakfasts and inns. They are good quality guest houses often in historic local buildings chosen for their charm and welcome. All accommodation is on a B&B basis. Please book early to ensure that we can secure our first choice accommodation. This independent walking holiday follows a stunning section of the South West Coastal Trail between Lyme Regis and Swanage in Dorset, with a possible extension to Corfe Castle. This spectacular coast is one of the most interesting and varied in the UK and has been designated a natural World Heritage Site by UNESCO with its cliffs capturing 185 million years of the Earth's history. Your self-guided walking trail starts at the picturesque old port of Lyme Regis, nicknamed "The Pearl of Dorset" and noted for the fossils found in the cliffs and beaches and its historic harbour. Your route then takes you over Golden Cap, which at 190m is the highest cliff in southern England and provides amazing panoramic views. After passing Abbotsbury, a beautiful village with the largest thatched building in the world, your route takes you onto the Dorset ridgeway with great views and numerous prehistoric earthworks. You'll have the opportunity to visit a number of historic villages crammed with old stone thatched cottages with welcoming inns if you fancy a real ale and tea shops if you'd prefer scones and cream tea. As you progress eastwards, so the variety and beauty of the landscape seems to increase with every new corner. 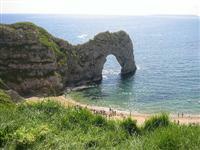 Highlights include the classic picture postcard sites of Durdle Door's rock arch, and the perfect circular bay of Lulworth Cove. Stunning cliffs accompany you through the army ranges (see note on introduction page about when it's open) in the most strenuous section of the walk. You can extend your walk from Swanage by following the Purbeck hills to the remarkable village of Corfe Castle and its castle ruins. 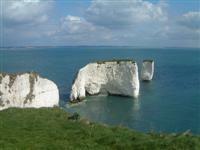 Find out more about the stunning Dorset Jurassic coastline and the Dorset weather. The walking days on this independent holiday average about 16km in distance. The walking varies with some easy sections, whilst others sections of the Dorset coastal path have some sizeable and reasonably steep ascents and descents. A couple of the days have a series of ups and downs making them quite difficult days for the grade with a maximum daily ascent of 650m. 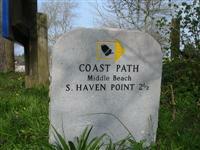 For the most part your walking trail follows a national footpath and it is therefore well signposted. Welcome, and night at Lyme Regis. Explore this historic picturesque port and stroll along the Cobb - its famous harbour walls. Please note that the stages may vary slightly depending on the availability of guest houses. This will not alter the walking trail or change the grade of the holiday. This independent walking holiday in Dorset has a range of good quality guest houses, bed and breakfasts and inns. In some locations the choice of accommodation is limited so please book early to ensure that we can secure our first choice accommodation.. Where possible, we choose guest houses with a distinctive local character, where charming surroundings are married with a warm welcome. All accommodation is on a B&B basis. Evening meals are taken in local cafes, tea rooms, restaurants and pubs, whilst lunches can be bought at local shops or from your guest house. A couple of examples are listed below. Abbey House B&B Located next to the abbey ruins in the wonderful historic village of Abbotsbury, Abbey House is a welcoming B&B in a lovely setting. There are 3 local airports with international flights: Bournemouth and Southampton are about 30 minutes drive away, whilst Bristol is about an hour away. 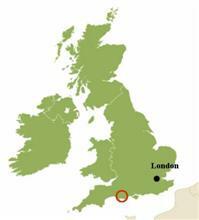 The 3 London airports are between and 2 hrs 30 and 3 hrs drive away. The main car hire firms are located at the airports. Take the X54 bus from Lulworth to Wool where you can catch a train train direct to London Waterloo. If you are returning to Lyme Regis to collect your car, catch the X53 Jurassic Coast bus at Wool. Take bus no. 40 to Wareham where you can catch a train direct to London Waterloo. If you are returning to Lyme Regis to collect your car, catch the X53 Jurassic Coast bus at Wareham.